Here are some of the best pictures from our Christmas Holiday in Utah and California. This was us in front of the Newport beach temple. here we are with our snowy sisters. This is the This is us wrestling an alligator in the LA Zoo. Zachary sunday we made while he was sleeping. Today we noticed a key difference between the development of young boys and young girls in sacrament meeting. There was a two year old boy and a two year old girl, each sitting on their father’s lap. The girl gently stroked her fathers hair and face. The boy gleefully and repeatedly banged the side of his head on his father’s chest. That is just our thought for the moment. Monkeys and doves should be friends. Janell and I are back into the swing of things in Iowa and are trying to figure out what to do this summer. We are thinking about going abroad, since this may be the last time we have a chance to do so before we are old and retired. Iowa has a summer programm in France, which we are considering, but we are also looking at several other programs with other law schools in Isreal, Russia, Sweeden, and even Austrailia. If you have any suggestions let us know. We are also waiting on some internships I applied to, to see what we would be giving up by going. Yesterday it got really warm, so we went running outside. We saw a baby mole, which scrambled away as fast as its stubby legs could carry it (slowly). It looked like a cute little mouse without eyes. Janell gave a great lesson in Sunday School today. That’s about all that has happened to us. Thank you for reading this and have a great day! 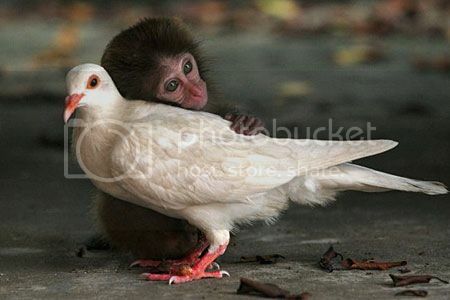 Oh and love one another like this monkey loves this dove.